To determine whether cervical spinal cord lesions predict the presence of thoracic cord lesions in multiple sclerosis (MS) patients. Single MS Clinic, AZ, USA. All MS patients, with MRI studies of the brain, cervical and thoracic spine obtained during a single scanning session, were acquired during a 1-year period. Clinical, demographic and imaging covariates were used in a multivariate regression model to refine predictors of thoracic cord involvement. A total of 687 patients were evaluated, and patients were excluded because of a diagnosis of other neurological disorders, not meeting the 2010 McDonald criteria for MS (n=222) or incomplete neuraxis imaging (n=339). The study cohort comprised 126 patients. There was an increase in the odds ratio (OR) of thoracic spine involvement when any cervical spine lesion was present (OR=6.08, 95% confidence interval (2.21–16.68), P<0.001). The multivariate logistic regression model demonstrated a substantial and significant increase in the odds of thoracic spine involvement when more than two cervical spine lesions were present, two lesions (OR 4.44, (0.91–21.60), P=0.06), three lesions (OR 19.76, (3.51–111.17), P=0.001), four or more lesions (OR 20.49, (1.97–213.23), P=0.012) and diffuse lesions (OR 71.94, (5.28–979.88), P=0.001), when adjusting for significant covariates including clinical symptoms, brain lesions, disease duration and treatment exposure. 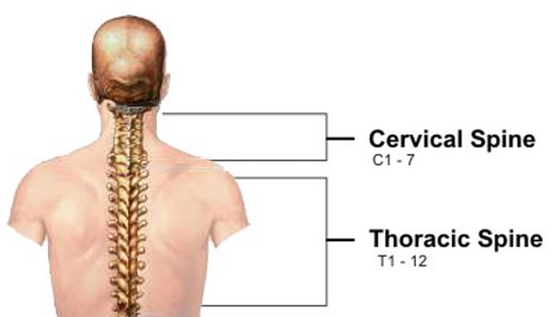 Thoracic spinal cord lesions appear to be predicated on the degree of cervical spine involvement in patients with MS, a risk that appears to be independent of brain findings or clinical features.